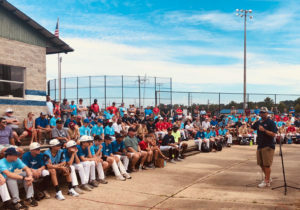 Devotionals are the foundation of the East Coast Sox baseball program. The Sox program came into existence because prospective collegiate and professional players had to sacrifice church to acquire high level baseball training and exposure. We designed a devotional program to meet the needs of a player’s spiritual walk with the Lord without sacrificing baseball development and exposure. Sox devotionals are designed for every member of the family to attend, so they may hear the proclaimed message of the gospel of Jesus Christ. Teaching devotionals will be Christian college coaches, pastors, and Sox Directors to ensure messages are relatable for our student-athletes and families. We are not affiliated with any church, religion, or denomination. We share God’s word as the infallible, inerrant word inspired by God. ALL are welcome to come here testimonies and gospel truths to strengthen their walk with the Lord.